There is never a second chance for a first impression. Custom Logo Floor mats at your entrance welcome your tenants/future tenants to your property, make a great impression and keep your rental management office clean. The most common shape and size would be a rectangle measuring six foot by four foot. While Custom Logo Mats are most often placed near the front door, there are endless possibilities available including runners for walkways, breakrooms, reception areas and pool/patios. Custom Logo Floor mats can be made from various types of material. If the mat will be subject to weather or if it will be placed on a hard surface, we recommend using a heavy duty indoor/outdoor material with a non-slip rubber backing, which will last for several years. If you are placing the Custom Logo Mat on carpet, you may want your mat to be constructed from a similar style carpet with a felt backing. If your logo is displayed multiple times near the location where your mat will be placed, then having the logo on your mat may be overkill. In this case, we would recommend a simple mat in a complementary color to your logo color(s). The simpler the logo, the easier it will be to recreate your custom mat. Intricate artwork and/or small or script lettering is often too difficult to duplicate, and will not be easily read on a mat. We can help you create a simple design that is complementary to your logo. Pricing for ProSource Custom Logo Mats varies depending on several factors. The type of material used, number of different colors in the mat design, size, and complexity of the logo. We offer free design consultations by phone or in person, where we talk to you to get an idea of what you are looking for, where the mat will be placed, style, size, etc. We will then send you a professional estimate outlining all of the options. We can even deliver the finished product! 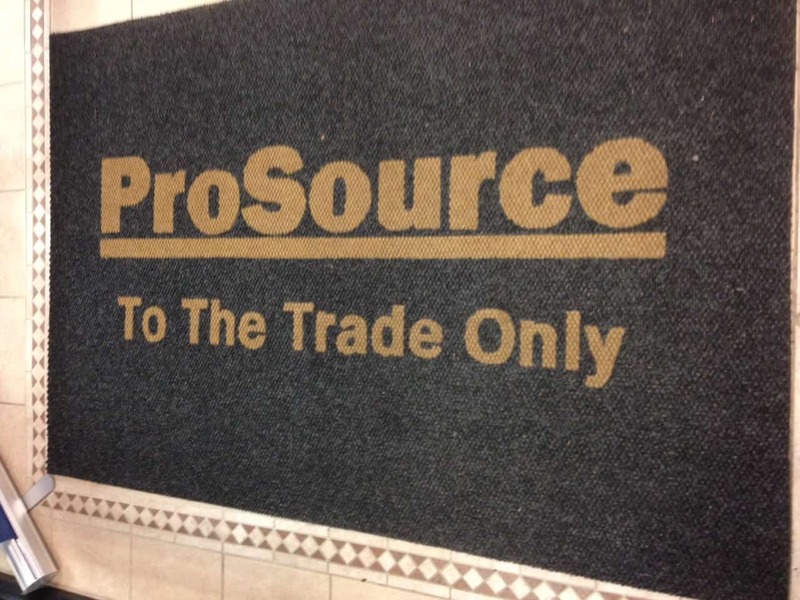 ProSource Wholesale Flooring of Marietta recently expanded our business to include a carpet fabrication division where we can create whatever you dream up. We not only create Custom Logo Mats, but we can help design custom area rugs and runners which can be used for staging in your Model Apartment, or be placed in common areas of your Clubhouses to add a classy touch. We offer quick turn around and the highest quality. Our in-house Rug Artisan, Michael, comes to us with years of experience and has placed hundreds of mats on properties around the area. Call us today! We are ready to help you with your project.